For those that don’t know “The Billy” came about from the Phoenix Cup 2018 in Florida when a team of disabled golfers from USA & Europe played at Rotonda Golf Club. Mr. Billy Cairns was a team member of the travelling European team and unfortunately passed away the day after arriving in Florida. This made the competition very emotional and ensured that the camaraderie between the 2 teams was unprecedented. The Phoenix Cup belongs to the SDGC and has been played under different formats over a long number of years. The event in Florida was co-organised by Jim Gales MBE of SDGC & Ian Halliwell aka “The Social Golfer” with the latter providing much sponsorship for the event as well as the “Pipers” that played in respect of Billy at the opening. At the end of the competition both The USA & European teams thought a lasting Transatlantic Pan disability Ryder Cup would be a fitting tribute to “Our Billy”. Discussions between Jim & Ian resulted that the SDGC would concentrate on their Phoenix Cup formats as in previous years and that Ian as the TSG & the charity BIG would concentrate on a long-term plan for the now named The Cairns Cup – “The Billy”. 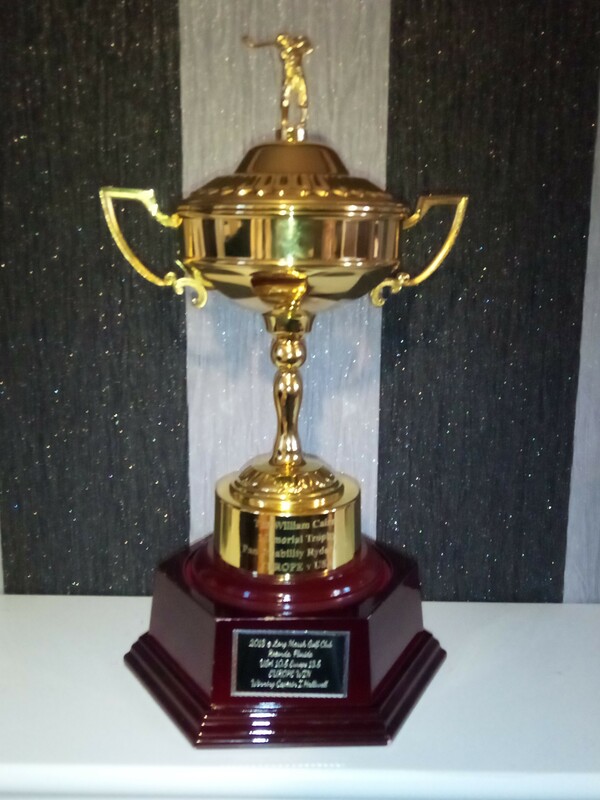 “The Billy” will be an Invitational Pan disability Ryder Cup that is available to all disabled golfers in Europe. It will show that DISABILITY IS NOT AN INABILITY and that all abilities can & will be involved. 5 Golfers in each of the following handicap categories. 1 Golfer in each category will be left out each day of competition. Players will only be guaranteed 1 game in the 3 days of competition. We are looking at having at least 5 different types of disabilities to be represented all together – This may or may not be achievable, but we will endeavour to do our best. We will also have both genders represented. I will be non-playing captain, but I have been allocated 2 vice captains in Mike Jones from Wales and Derek Milne from Scotland plus I have 1 more space available for a third VC TBA later. Because of our close relationship with SDGC & DGA we have offered their OMM winners of 2019 an opportunity of a place on the European Team for 2020. Therefore there’s 10 spaces available to all other disabled golfers. The team will be announced in January 2020 giving the team plenty of time to get to know each other and form a great team spirit ready for the event in September 2020. • Players must be a member of a recognised disabled golf organisation like EDGA, DGA, SDGC, BIG or any other national organisations. The selectors will take all the above considerations into account when selecting the team and a reserve list. Strictly NO FREE PLACES GIVEN. • 3 Evening Gala dinners. The cost will be £600 for everyone but only the selected players will play golf – Any additional golf, practice rounds or non-team attendees will have to be paid for as required & availability. We are asking for disabled golfers from EUROPE ONLY to show their interest in the event by sending me Kevin Booth a PM on messenger leaving your email address. Then I can get back to you for more information. Looking forward we hope that “The Billy” will become a self-standing organisation jointly run by both European and USA teams, and that people will get involved in its promotion & marketing improving Pan disability golf worldwide. Personally, I would like to thank Celtic Manor resort, Ian W Halliwell, Mike Jones & Derek Milne for their support in setting us this event. It’s a location far above our initial expectations which now means we must raise the bar in the way we conduct ourselves from now until September 2020. The competition starts on the anniversary of 911 and the history of “The Billy” it’s already building up to an emotional event. We are looking for hole sponsors for the event, plus other sponsorships from clothing to equipment if there’s any companies interested please get in touch with me through British Inclusive golf website or Facebook.